But Hansen, other members of the Bates community and three visiting scholars spent that afternoon seeking a better view of the academy’s work amidst the tumult, amidst the creation and destruction, wrought by digital media. 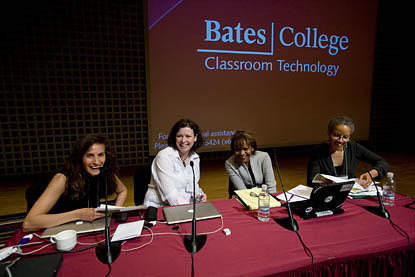 That was the revolution Hansen invoked as she convened “The Teaching and Learning Shift: Diversity and Technology in the 21st Century,” her third annual symposium exploring issues of diversity at Bates. 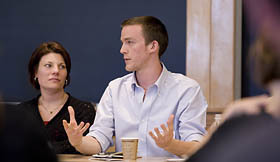 The event examined the intersections of diversity and technology, and what they portend for academe. But if the title was “The Teaching and Learning Shift,” a different and bigger kind of shift resonated throughout: The changes in power structure, the threats and opportunities, that generational transitions in media and diversity hold out. Take, for example, the surfeit of content on the Internet, and the potential and the dilemma it presents to faculty. If knowledge is power, who has the greatest leverage: the professor with his Great Books or the kid with the Google smarts? Symposium organizer Leslie Hill, associate professor of politics and special assistant to the president for diversity initiatives, laid the day’s thematic groundwork in her introduction. The event put a new spin on the old commonplace of the generation gap. It examined two new distinctions between today’s students, on the one hand,and their parents and teachers on the other. First, as diversity has become more visible and cultural boundaries more permeable, young people experience and perceive diversity quite differently from their elders. Second, as Hill said, “today’s learners use tools unavailable, and perhaps unthinkable, to earlier generations” — a profound adaptation to technology evidenced through the afternoon by the term “digital natives,” young people whose ease with digital media is virtually innate. The opening panel introduced the guests and concepts for consideration. Joline Blais, associate professor of new media at the University of Maine, offered variations on the idea that digital media can be a robust tool for empowerment and for subverting old, destructive hierarchical habits in the classroom. Examples from UMaine, such as a “ThoughtMesh” site that allows students to aggregate, tag and contextualize scholarly articles, were intriguing. 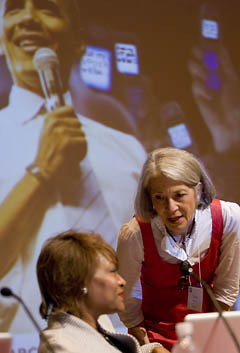 Anna Everett, an authority on African American film and culture and a professor of film and media studies at the University of California, Santa Barbara, introduced herself with examples of real impacts that digital media have made in the civic and political realms. The outstanding case was the Obama campaign’s skillful use of online organizing; less known was the use journalist Howard Witt made of the African American blogosphere to showcase a instance of racial injustice in Texas. Eszter Hargittai, associate professor of communication studies at Northwestern University, studies the interaction of information technologies and social inequalities. She challenged common wisdom about digital media users, suggesting that differences in skill among young people create a participation gap — and that those differences are driven by socio-economic background and educational attainment, among other factors. Breakout sessions ran through the afternoon, with Blais, Everett and Hargittai making note of salient themes, concerns and suggestions for action. Three sessions explored the role of digital technology in teaching and learning, while others looked at civic engagement through digital media, and at identity and difference. During the breakout session “Digital Media and the Arts,” faculty members praised the Web as the source of what they need most: easy and quick access to video clips of artists’ works, often through services like YouTube. “Dance is visual, and to teach dance I must have visual materials or it doesn’t make sense to students,” said Carol Dilley, assistant professor of dance. But faculty also see a downside of this click-and-view aspect of teaching. Online visual content is often presented without canonical context, so even more than before, faculty have to work hard to “fill in” the missing ideas, said Dale Chapman, assistant professor of music. • Technology is often made a scapegoat for other problems. For instance, the generational divide among users is exaggerated, and, as Everett said, can create a destructive false dichotomy. • Still, the divide is real. As Everett reported, “There have to be reward structures to encourage faculty to engage with the black hole of technology.” At the same time, the current practice of hardware and technical instruction is incomplete — the missing piece being guidance in the effective pedagogical application of high-tech tools. Blais told a story about a faculty member who was using Facebook to take a student to task about late assignments — and how the student later used the same public forum to press the professor to deliver an overdue assessment of the student’s thesis.